Housing eats up far too much of household incomes. The best way to lower the cost basis of housing is for prices to revert to 1995 or lower. Healthcare (i.e. sickcare) costs rising? Borrow another trillion dollars to pay the bills. Housing costs still too high? Borrow $1.2 trillion to buy toxic dead-zone mortgages so irresponsible lenders can pump out another couple trillion in soon-to-be-toxic mortgages. Higher education costs going through the roof? Make students borrow hundreds of billions of dollars and enter a life of debt-serfdom to pay for their education. Borrowing trillions to pay out-of-control price spirals will lead to national insolvency. 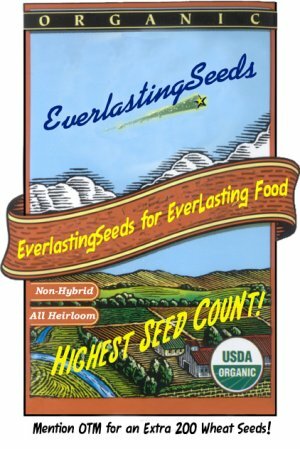 There is no other end-state. The solution is to lower the cost structure at the fundamental level. You want to encourage small businesses? Then let every commercial real estate owner in the nation go bankrupt and sell all the millions of square feet of commercial space for 10 cents on the dollar. The new owners' cost basis will be so low that they can rent out a space for $500/month that once required $5,000/month just to cover the bloated mortgage on the grossly overvalued property. Let's look at some charts for cost-basis context in residential housing. 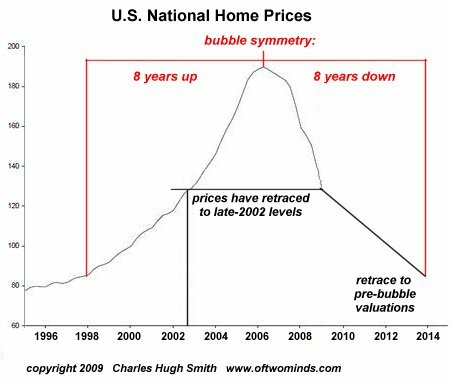 A 35% decline in housing from current levels is already baked into the reversion to pre-bubble valuations. The Fed is trying to hold back the tide with very expensive sand castles; now that the Federal government owns the insolvent Fannie Mae and Freddie Mac mortgage giants, it has shifted the speculative lending to FHA (Federal Housing Administration) which as a result is now in financial trouble and needs a bail-out to remain semi-solvent (surprise!). This is the result of hyping home ownership as a speculative investment during bubbles: equity plummets as prices revert to historic averages. This is a rather staggering chart; as a percentage of GDP, homeowner equity has already dropped below the 1997 pre-bubble line. As far as actual equity is concerned (as opposed to nominal prices), the housing bubble's gains have already been completely erased. It stands to common sense that negative equity drives foreclosures. At some point, the burdens of attempting to pay a mortgage which far exceeds the value of the property makes little financial sense. Given that 15+ million households have negative equity, we can see that the foreclosure/short-sale pipeline is stuffed for years to come. 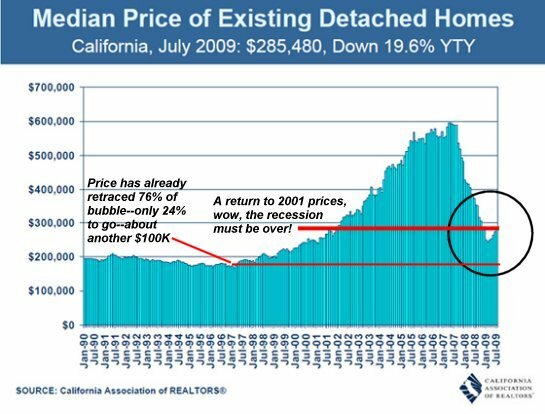 California prices have already retraced about 3/4 of the bubble; another 35% (roughly $100,000) would complete the reversion to pre-bubble valuations. It is important to note that the housing bubble had little to do with actual construction or material costs. The bubble was entirely debt/financial-based. As this classic chart shows, construction costs actually dropped from 1980s peaks. As for demographics/population driving prices higher--if that's true, then why are there (according to the Census Bureau) 18 million vacant dwellings in the U.S.? The cause of high rents is high mortgage costs which are caused by high valuations. Joe Blow buys a rental building in the bubble years and his mortgage is huge. So he has to raise rents in order to make his monthly nut. Is the high rent related to anything other than a speculative frenzy? No. So if Mr. Blow's building goes into foreclosure and is auctioned off at 50% of what he paid, then the new owner can cover the (revalued) mortgage for considerably less money. Thus, resetting housing valuations for owners also resets housing costs for renters. From at least one point of view, the entire "project" of persuading Americans that homeownership was the high road to accumulating wealth was a stupendous scam perpetrated by those industries which benefitted from the elevation of homeownership to quasi-religious status. Yes, it creates stable communities, etc., but when households essentially enter debt servitude to support owning a house, driving up rents in the "bargain," is either the household or community served in the long run? Housing is the single largest expense for most people. For years, government has discouraged supply in lots of places (like the S.F. Bay Area), encouraged larger, more expensive houses, and encouraged borrowing. Even now, they'd rather prop up prices to keep down the number of foreclosures, rather than let them drop to cut living expenses. Our obsession with owning a house causes lots of people to stretch their finances. They end up cash poor, but sure they have this great investment in the walls. Yes, there are many good reasons to own a piece of land with a house on it, but financial speculation isn't one of them. Yet that is the reason that has been touted, either directly or implicitly. The government's doomed obsession with propping up high house prices has left one class of homeowners in the shadows: the 1/3 of homeowners who own their homes free and clear. Those without a mortgage resisted the temptation to extract all their equity; they have no mortgage. Price fluctuations don't mean much to them. The same can be said of those whose mortgage was based on pre-bubble valuations; yes, it was glorious to be worth a small fortune at the top but life goes on, etc., as the mortgage is still affordable and the owners still retain substantial equity even after prices have fallen. For those who are underwater, short-selling (selling a house worth less than the mortgage and the bank accepts the loss) or in foreclosure, isn't a reversion to much lower values in their interests, too? Once they rebuild their finances and credit, in a few years they might be able to buy a house for a price which is actually affordable by historic standards (i.e. about 25% of net income goes to the mortgage). As noted above, lower valuations help the nation's renters, too, lowering the cost basis of the property owners and making renting and buying more competitive--a boon to both markets. The only real solution to unaffordable, high-cost structures is to dramatically lower the cost basis of the entire sector/industry/market. Housing prices dropping another 35% and removing the speculative mindset from housing would in the long run greatly benefit households and the nation. Thank you, Alberto R. ($20), for your ongoing generous contributions, financial and intellectual alike, to this site. I am greatly honored by your support and readership.